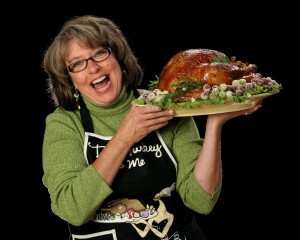 Renee Ferguson, Cookbook author, guest speaker, and “Turkey Diva” joins us on BourbonBlog.com. As a former Butterball expert, Renee has appeared on the FOOD NETWORK’s “Throwdown!” with Bobby Flay, in Southern Living and I recently I did an interview with her our sister website Tripodder.com, listen to this podcast below now! 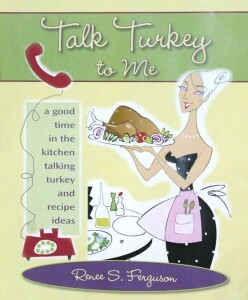 Renee also shares her Bourbon Turkey recipe with us below from her book Talk Turkey to Me, which she sells on TurkeyTools.com . Watch Renee appear on “Throwdown” with Bobby Flay this week, here is the schedule of when this episode will air on Food Network through November 22, 2009. “This Bourbon sauce is a wonderful alternative to gravy and provides a sensational flavor burst with every bite!” – says Renee on this recipe. * Remove giblets and neck and from turkey. Blot dry with paper towels. * Sprinkle turkey cavity with salt and pepper, and place a quartered apple and onion in the cavity. 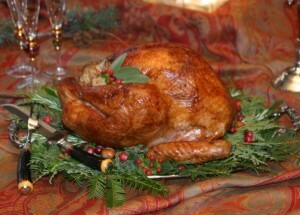 * Place turkey, breast side up, on a wire roasting rack in a shallow open roasting pan. * Spray or brush turkey with olive or vegetable oil. * Roast turkey uncovered in a preheated 325°oven between 3 – 3 ½ hours. No need to baste at this time. * After 2/3 cook time shield the breast with a tent of aluminum foil. Continue cooking. * Meanwhile, in a small saucepan, combine preserves, bourbon and bitters over low heat. Cook until preserves are melted. During the last 30 minutes of roasting time, remove the foil and baste bird several times with bourbon peach glaze. Continue roasting uncovered and baste every 10-15 minutes. Reserve any remaining glaze to serve on the side. * Continue to roast until the thermometer registers 180°F. in the thigh. * Remove turkey from oven. Discard apple quarters. Allow turkey to rest for 15-20 minutes before carving. I have a similar thermometer that was my souvenir for my second trip to the US. I didn’t realize that we have to insert it to the chicken while it is cooking until I saw it being used in a movie.